I want to extend a public thanks to Adam Pagnucco for the tremendous work he has done on Maryland Politics Watch over the last several years. 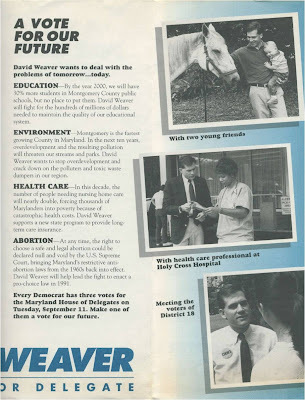 Adam's role in MPW grew steadily since he began putting up the occasional post and he took over as the primary blogger--accounting for the vast majority of posts--after I won election to the Chevy Chase Town Council. Thanks to his amazing effort combined with sharp, witty and well-researched pieces, the readership of MPW rose exponentially under his leadership. 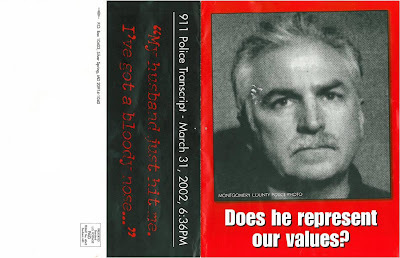 Unlike on many blogs, Adam's pieces were not mere regurgitation of articles from the mainstream media but based on time-consuming data collection along with screen shots of web pages that politicians learned to dread. 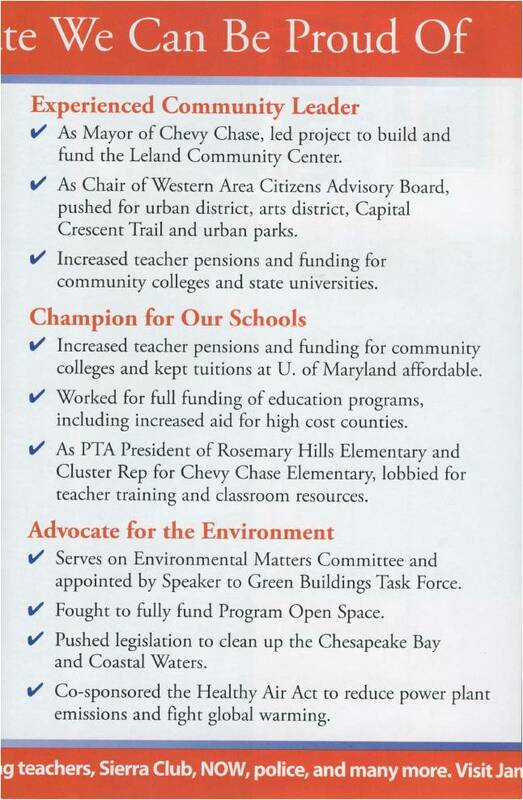 Adam raised the profile of numerous issues from Costco subsidies to the tough choices that the County and the State face regarding transportation. He skewered politicos with the best of them but also found time to praise the gutsy and help bring to light new ideas that deserved a broader audience. I didn't always agree with Adam. Occasionally, I disagreed strongly with his calls as he did with mine. 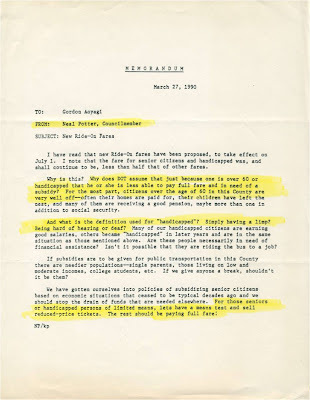 However, I always knew that Adam came at politics with a deep commitment to practical solutions to real problems and little patience for the silly, the sanctimonious, or the stupid. 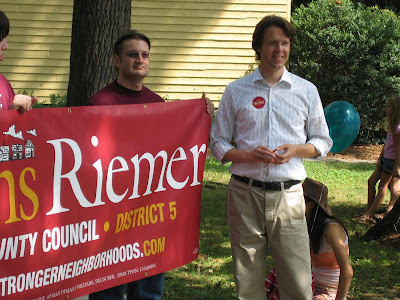 Adam is now getting the opportunity to leap to the other side of the fence and rightly concluded that he cannot blog independently while serving as incoming Councilmember Hans Riemer's Chief of Staff. I have no doubt he'll bring a lot to the position and learn a lot as well. MPW's loss is hopefully not just Hans's gain but Montgomery's as well. Adam, we'll all miss you and the verve you brought but wish you all the best in your new job. You're going to need it with the tough calls headed your way down the Pike. And heck, it can only lead to more great writing at some point in the distant future. 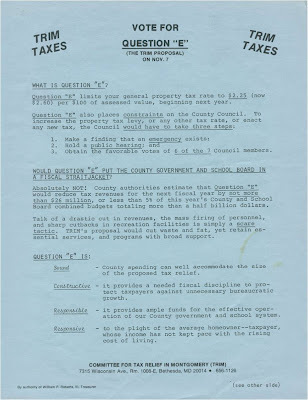 If anyone can "Backstairs at the County Council in Rockville"--surely the most deadly book title since Mordecai Richler gave that award to "Canada: Our Friendly Neighbor to the North"--a bestseller years from now, it will be Adam! We're in the Money. . . Things may be tough but they are way tougher in other states. Maryland is one of five states where household median income rose over the past decade and you'll notice that we're the wealthiest of those five states. 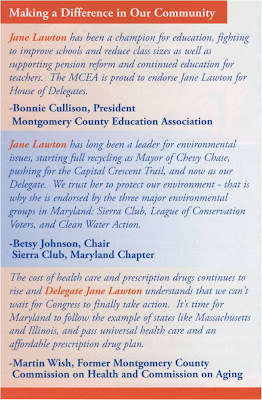 So much for the argument that Democrats have ruined Maryland--we're the most successful state in the country. Full story from the Economist (account may be needed to read the story). Yes, I know I’ve told you this before, but now it’s for real: I am leaving Maryland Politics Watch. The last time I quit, I had just turned 40 and my son had just turned 1. I had figured out that the demands of the blog had grown too gigantic to allow me to work in a full-time job and to be a full-time Dad. Then I quit my job. Who wants to travel all over North America half the time when your kid is just starting to say “Da-da” regularly? 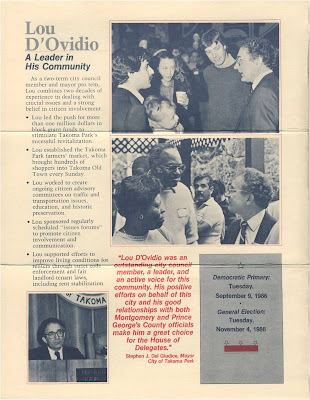 At that point, there were just five weeks left in primary season and I decided to blog the hell out of the elections. And what a primary it was! 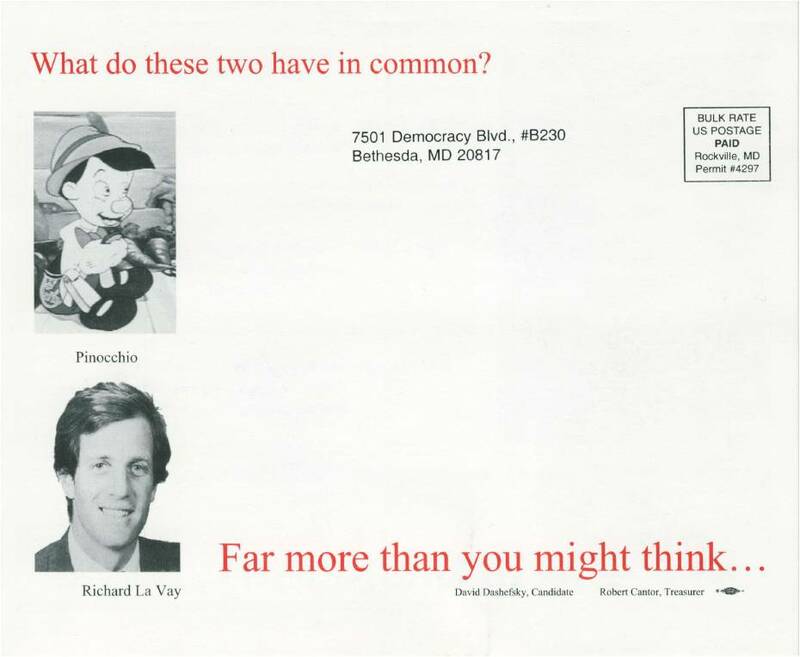 Who can forget Saqib and the Seven Dwarfs, the Nuke or the Holocaust Mailer? This was one of the most remarkable political summers in MoCo history, and you and I had a front row seat. I was happy to provide the theater space. Hans and a supporter (guess who?) in 2006. 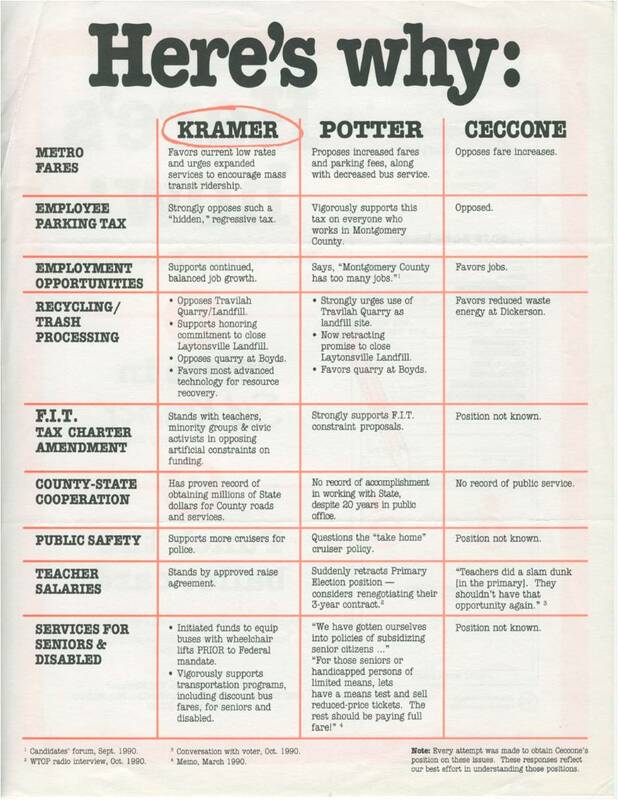 I’ve left a going–away present for you: a treasure trove of campaign material from our county’s political history. 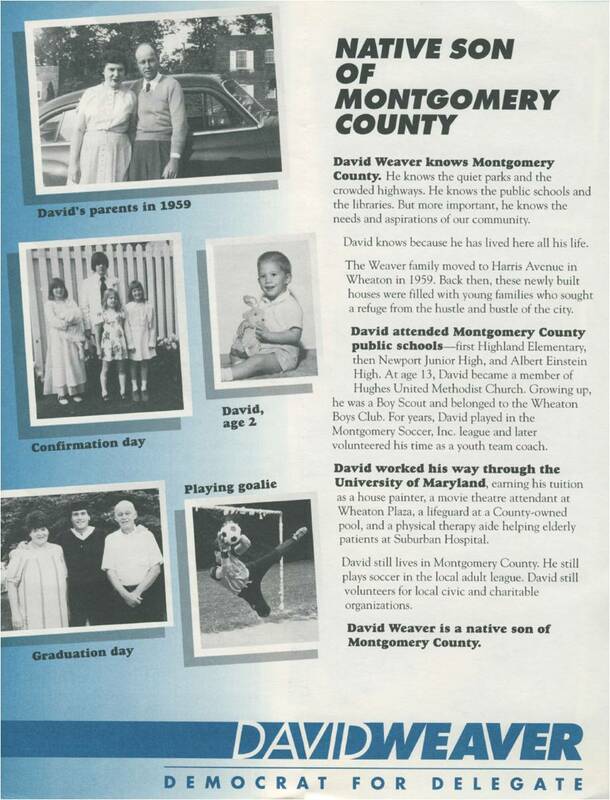 These are the men and women who have made MoCo and Maryland what they are. Their stories are worth remembering, both to emulate their successes and to avoid their mistakes. Besides, where else can you find stuff like SchaeferMania? That’s about it for me, folks. Now there is a silver lining in all of this. The next time the snow plow doesn’t come, the trash is not picked up, a pothole is not fixed or a sidewalk is cracked, you can blame me for it! Won’t that be fun? 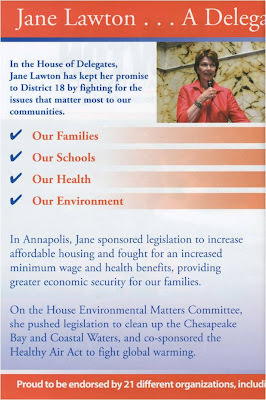 Town of Chevy Chase Council Member and Mayor Jane Lawton first ran for a District 18 house seat in 2002, finishing fifth. But she was appointed to replace retiring Delegate John Hurson in late 2005 and proved to be so popular in office that she ran away with first place in 2006. Unfortunately, she passed away soon after. 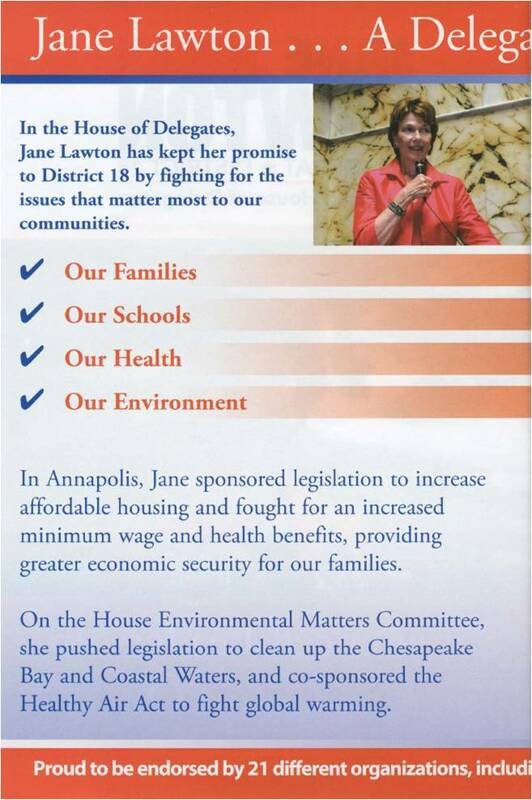 Jane Lawton was one of the most decent, honorable, humane and beloved office holders in the history of this county. 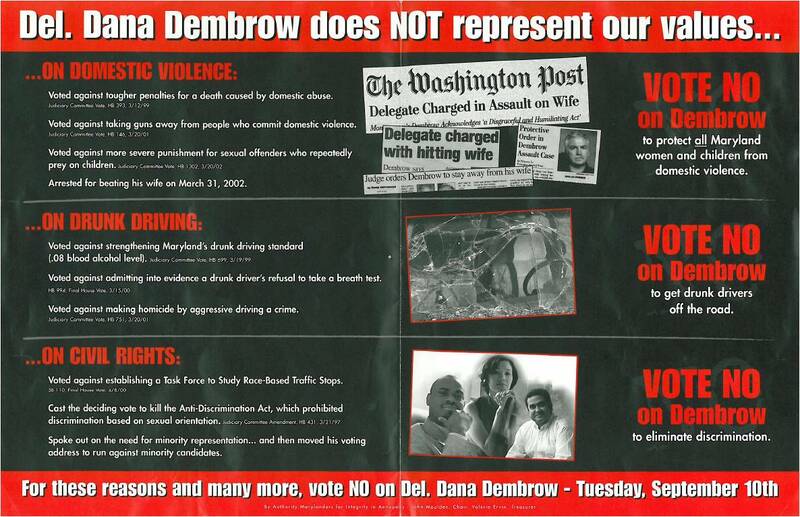 This is one of her mailers from 2006. 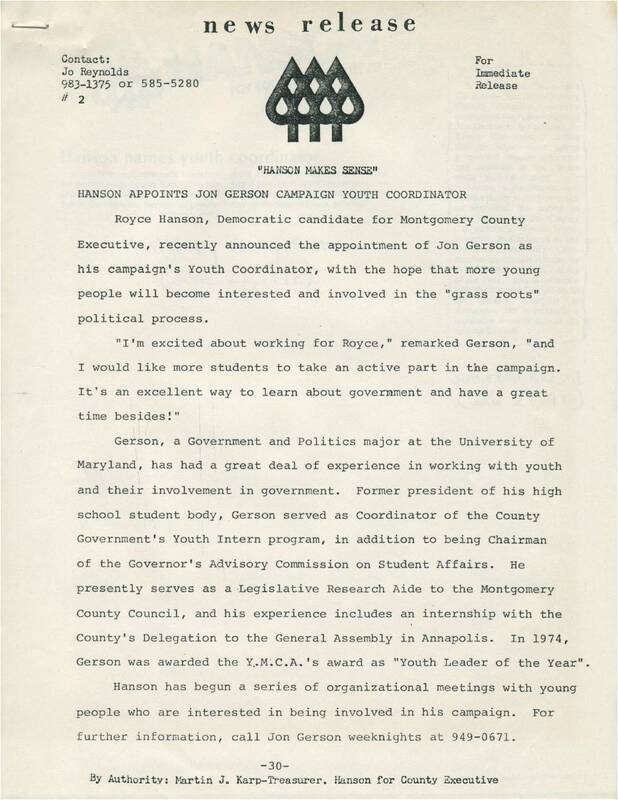 Legendary Planning Board Chairman Royce Hanson ran for Congress twice in the 1960s, for County Executive in 1978 and for County Council this year. He lost all four times. 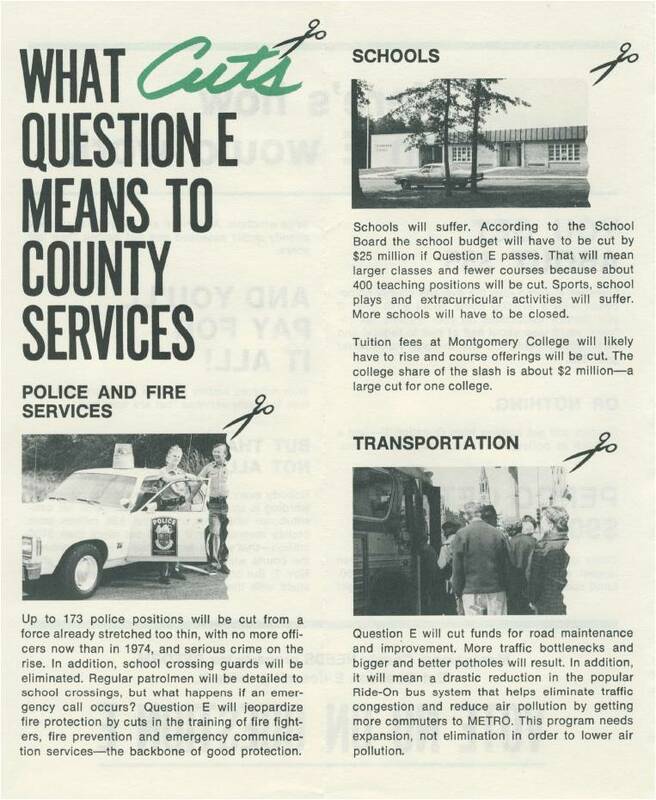 But Hanson's legacy to the county in setting its planning procedures, creating the Agricultural Reserve and steadily pushing MoCo towards smart growth far exceeds that of all but a handful of elected officials. Here is some literature from his County Executive campaign. 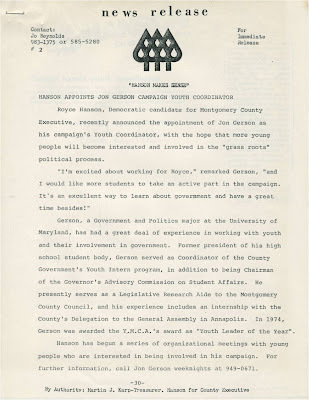 Note his team (which included Council Members Neal Potter, Esther Gelman and Mike Gudis), his cookie recipe and the press release announcing the hire of student activist Jon Gerson (yes, that Jon Gerson) as his youth coordinator! 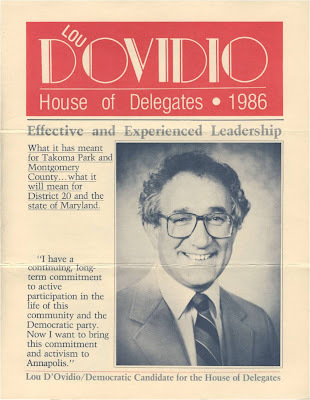 Dana Dembrow was elected to a District 20 House seat in 1986 and spent many years fighting with the rest of his delegation, which included Senator Ida Ruben and Delegates Sheila Hixson and Peter Franchot. All three wanted him gone, but they could not figure out how to get rid of him. Finally, Dembrow committed a critical mistake: he was arrested for hitting his wife. 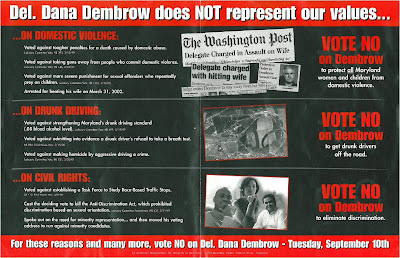 Right before the primary, this mailer featuring his mug shot and other like-minded lit swamped the district and Dembrow finally lost. After the election, campaign finance reports revealed that the rest of the delegation spent thousands of dollars on the lit. 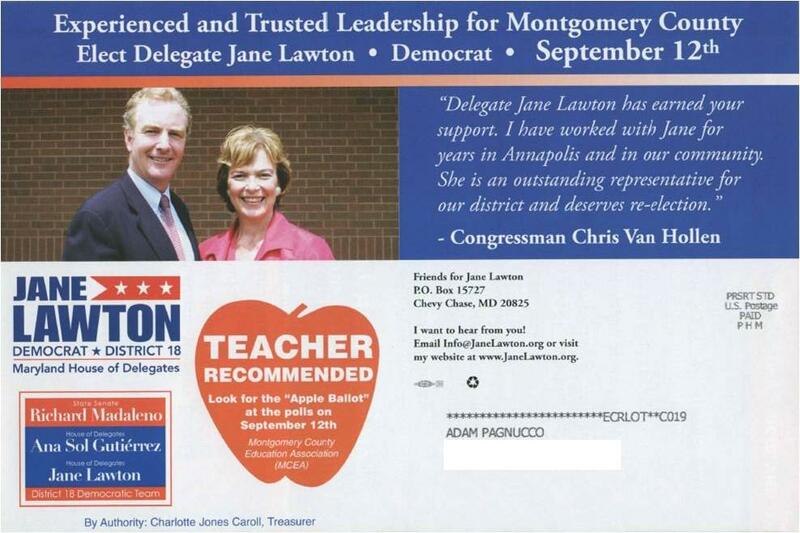 This piece has gone down as possibly the single most effective negative mailer in the history of Montgomery County. Connie Morella surprised MoCo by winning a District 16 Delegate seat as a Republican in 1978. 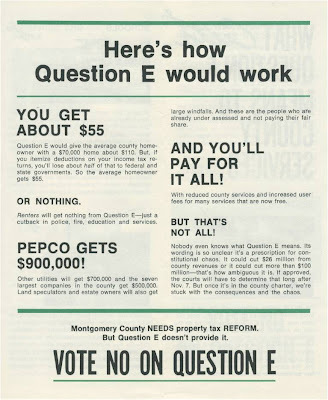 She surprised the county again by running for Congress two years later. 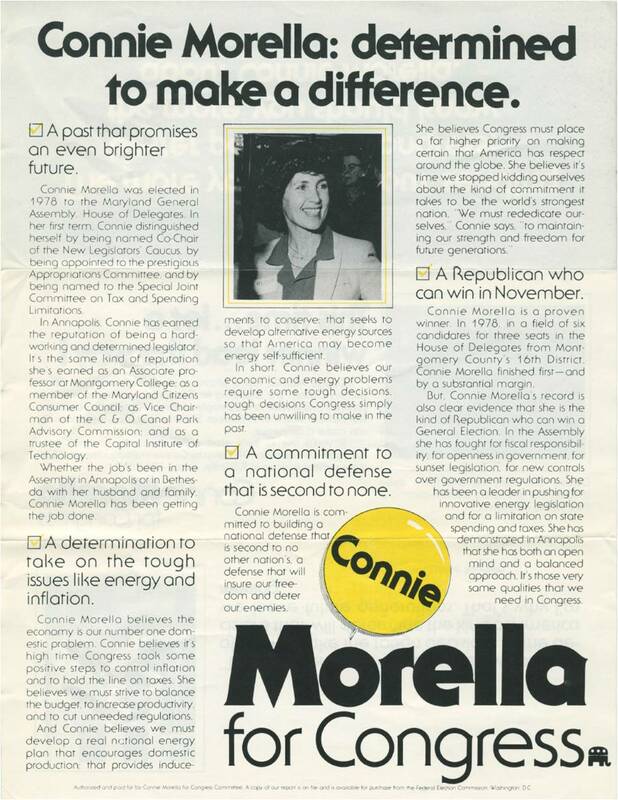 She lost in the GOP primary, but Morella would upset Stewart Bainum for Congress six years later and serve until 2002. 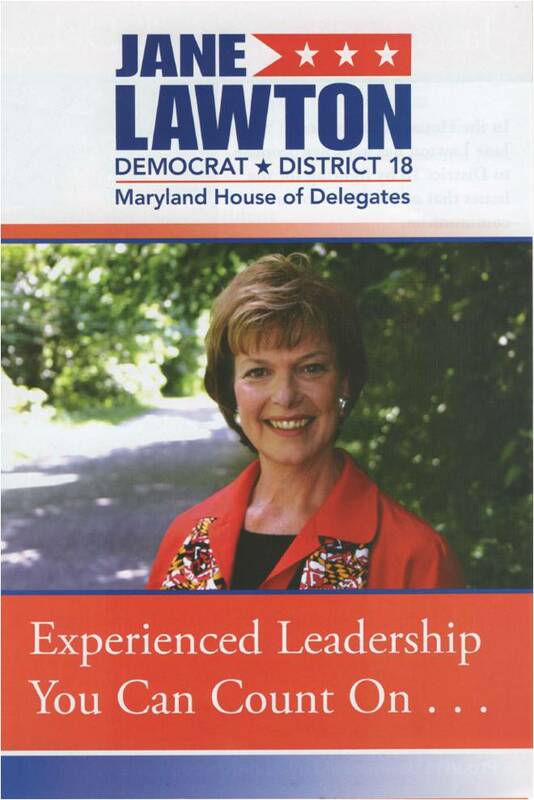 She and MoCo's first Executive, James Gleason, are probably the two most successful Republicans in county history. 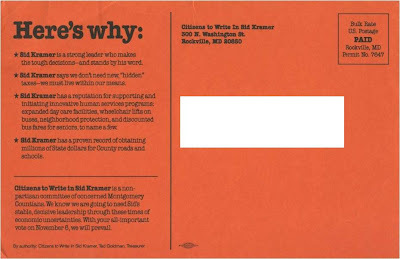 Below is a lit piece from her 1980 campaign. 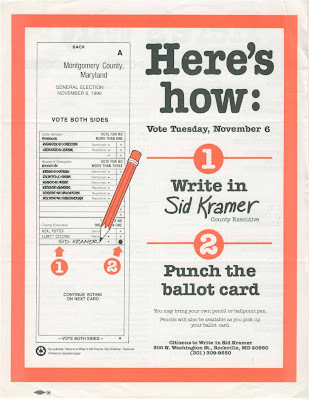 Sid Kramer served one term on the County Council and two terms in the Senate before becoming Montgomery County's third Executive in 1986. 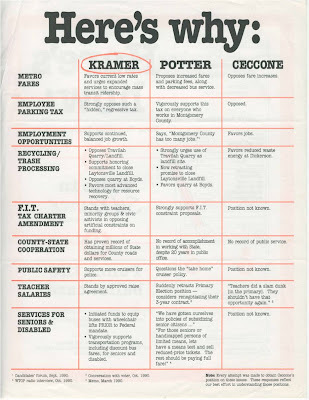 Most people expected Kramer to win reelection easily. But five-term County Council Member Neal Potter filed to run at the last minute and beat Kramer in the Democratic primary. 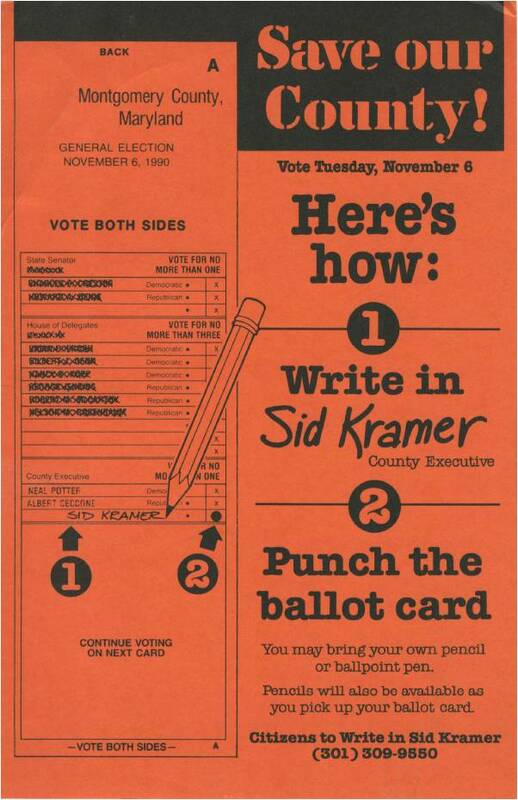 Undaunted, Kramer launched a write-in campaign for the general election, telling voters to "Save Our County" by sending him back. 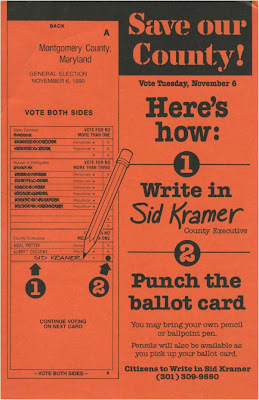 Kramer lost, but he was not through challenging the Democratic establishment. 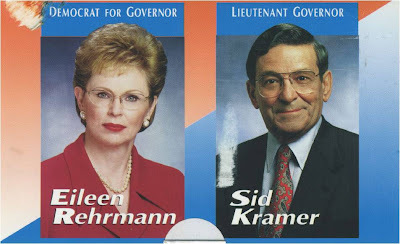 In 1998, Harford County Executive Eileen Rehrmann recruited Kramer as her Lieutenant Governor candidate in her challenge to incumbent Parris Glendening. 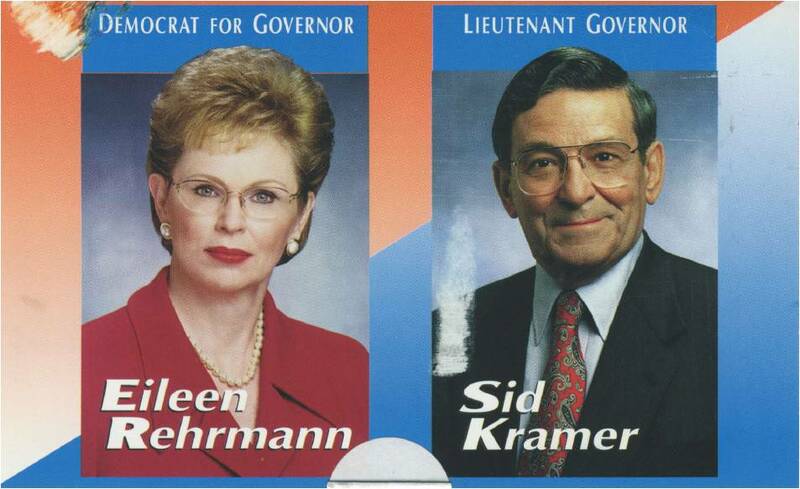 The Rehrmann-Kramer team lost with 13% of the vote in the primary and Sid Kramer was never on the ballot again. 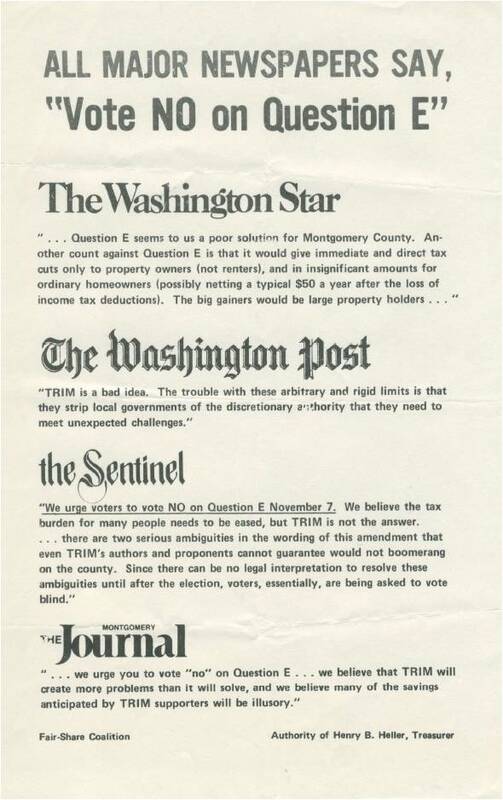 We reprint his 1990 write-in lit pieces, as well as the cover to his joint piece with Rehrmann, below. 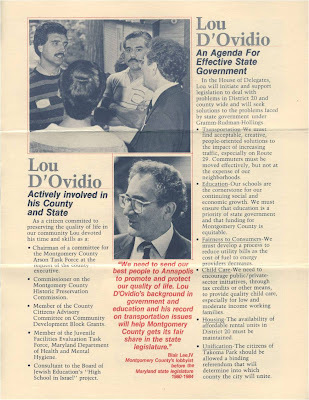 These are four of the most influential people in Montgomery County's history, standing together in a unique photo from 1981. 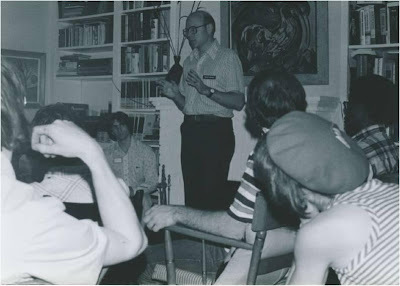 Norman Christeller (left): County Council Member and Planning Board Chairman. 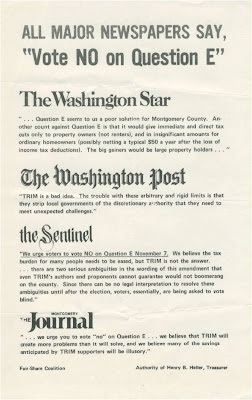 Author of the county's law requiring Moderately-Priced Dwelling Units in new residential developments and leader of the fight against the 1978 TRIM amendment. 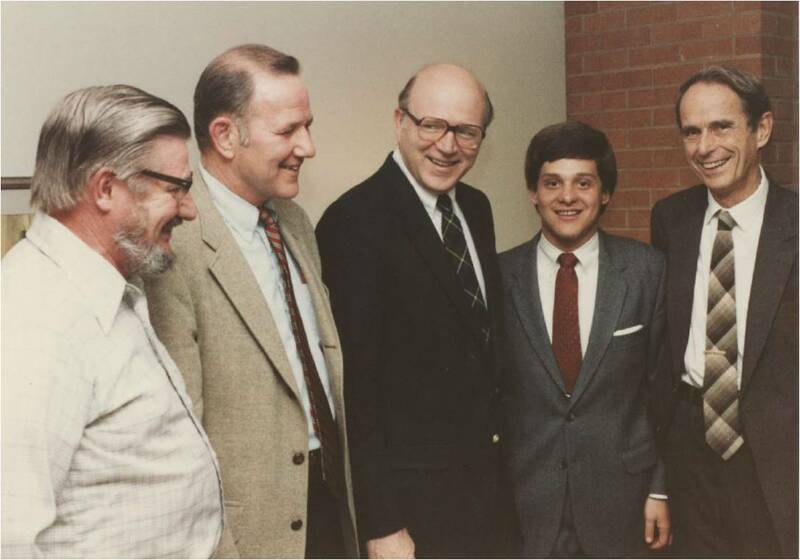 Don Robertson (second from left): District 18 Delegate and House Majority Leader. Royce Hanson (center): Two-time Planning Board Chairman and founder of the Agricultural Reserve. Neal Potter (right): Six-time County Council Member and one-term County Executive. That innocent-looking twenty-something standing with these legends is none other than MCEA's Jon Gerson, who was then a staff assistant at the County Council. Thanks for sharing the photo, Jon! 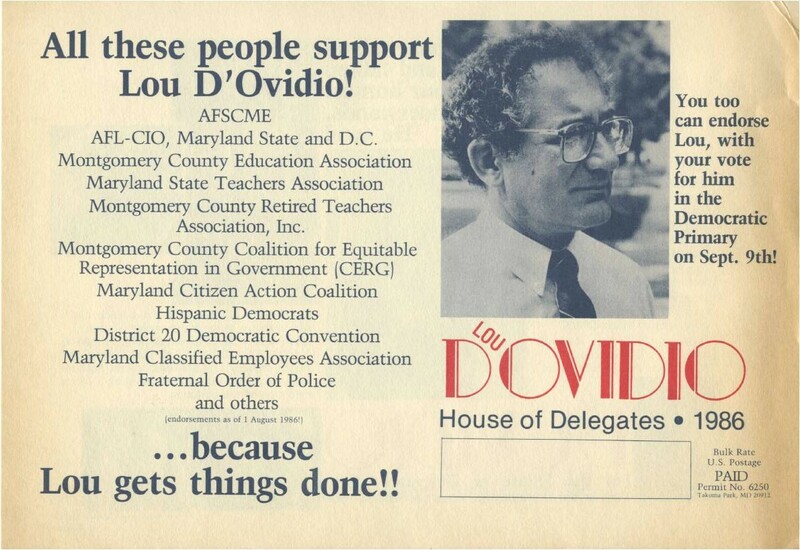 Lou D'Ovidio was a teacher and MCPS administrator for 25 years and served two terms on the Takoma Park City Council before running for a District 20 house seat in 1986. He ran on a slate with Delegate Ida Ruben (who was running for Senate), Delegate Sheila Hixson and House challenger Robert Berger. 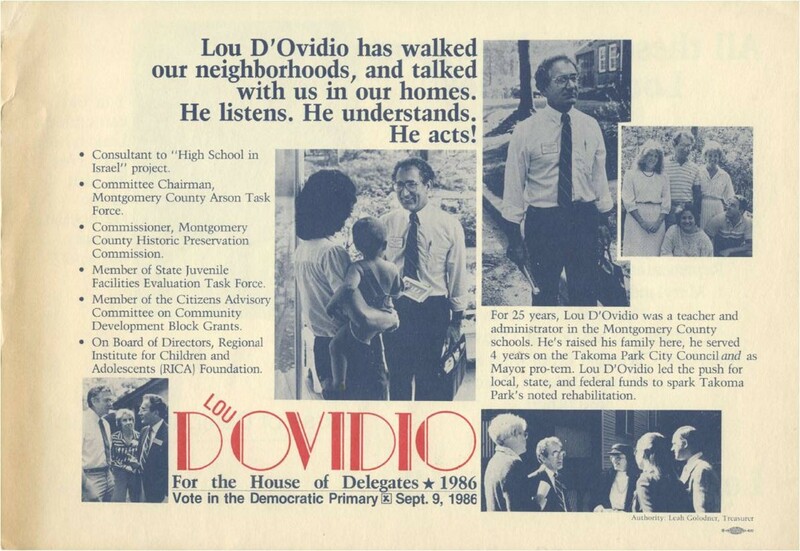 D'Ovidio finished fifth in the primary behind Peter Franchot, Hixson, Dana Dembrow and Berger. 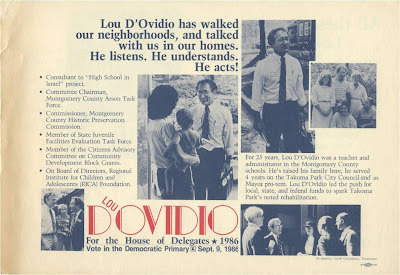 D'Ovidio went on to work for many years as Council Member Mike Subin's Chief of Staff and now works for Roger Berliner. 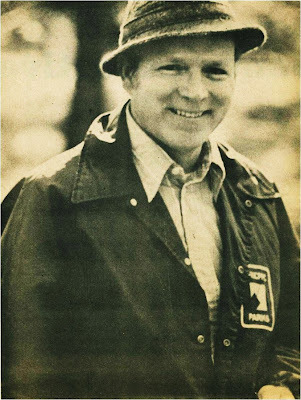 He remains one of the most respected veterans of Rockville. 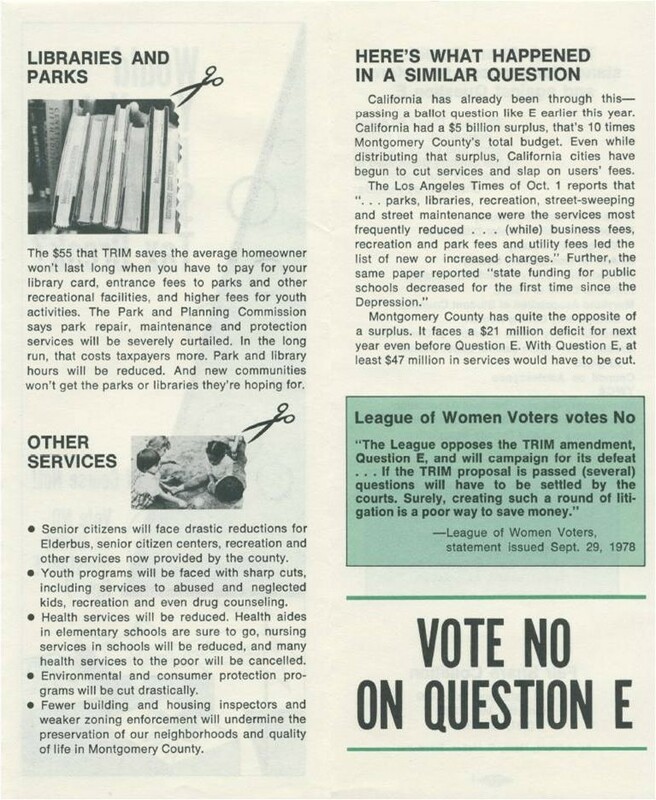 Here are two of his lit pieces from 1986. One of them even features a quote from Blair Lee! 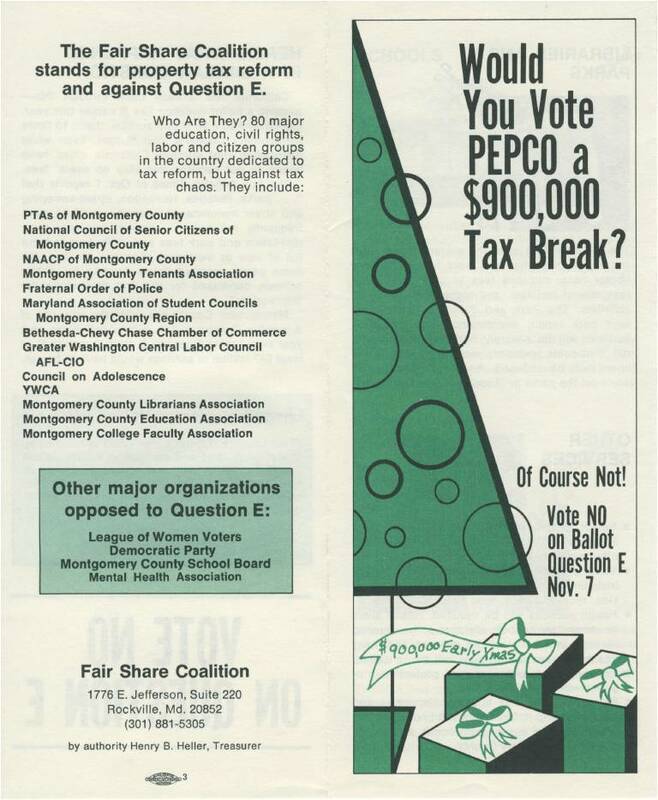 Roger Berliner first ran for the County Council District 1 seat in the 2000 special election to replace the retiring Betty Ann Krahnke. 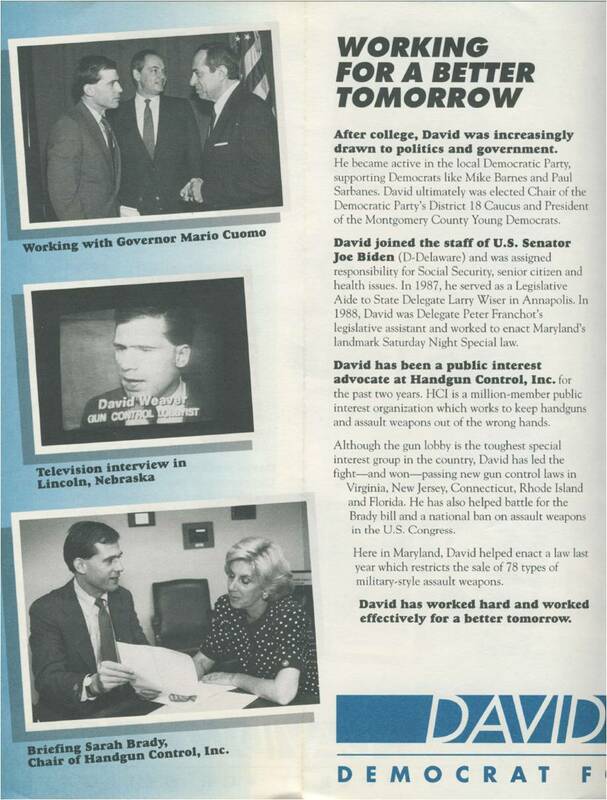 Berliner was defeated in the primary by Pat Baptiste, who in turn lost to former GOP Senator Howie Denis. Berliner returned to defeat Denis in 2006 and just won a second term. 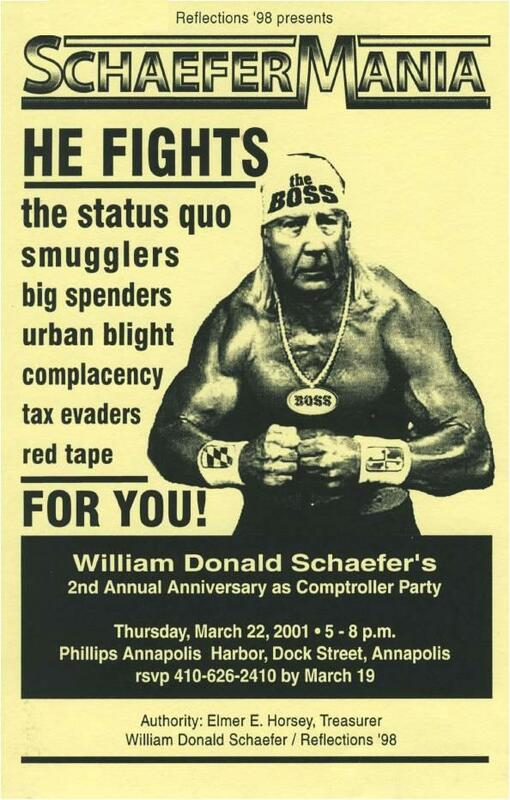 This is a lit piece from Berliner's first campaign in 2000. 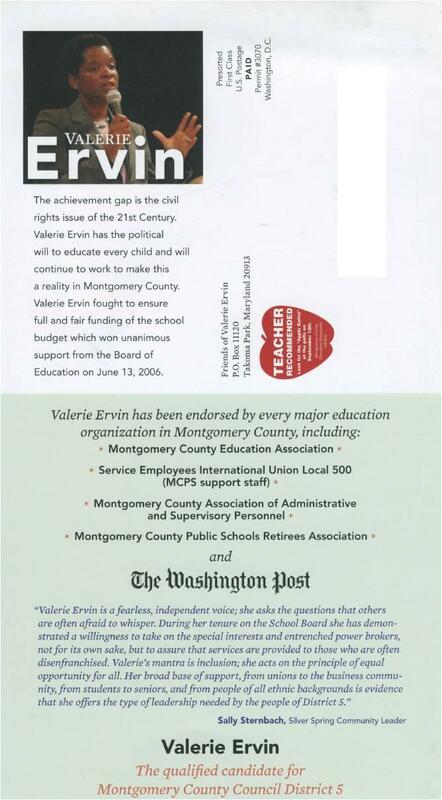 Incoming County Council President Valerie Ervin has enjoyed one of the more rapid rises to prominence in MoCo history. 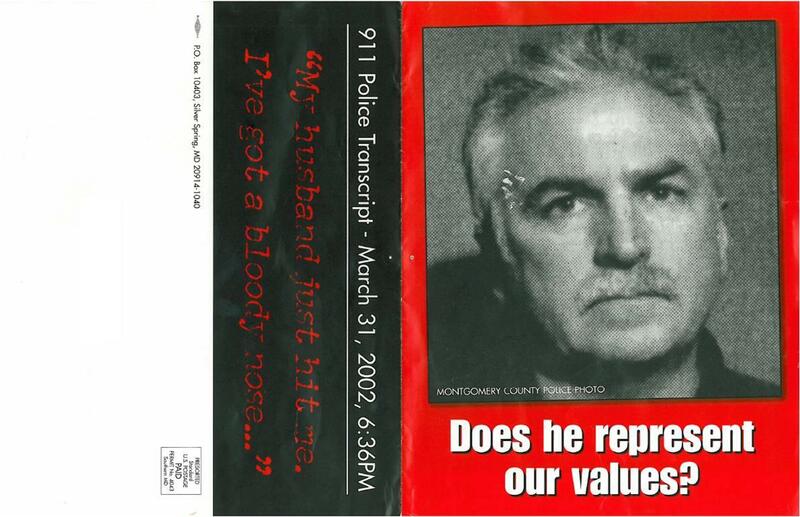 In 2002, she became Council Member George Leventhal's Chief of Staff. 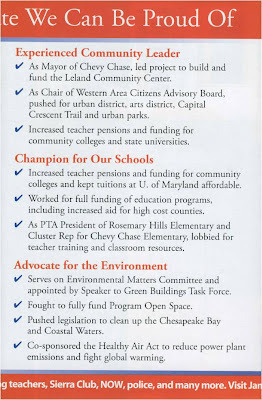 In 2004, she was elected to the school board. 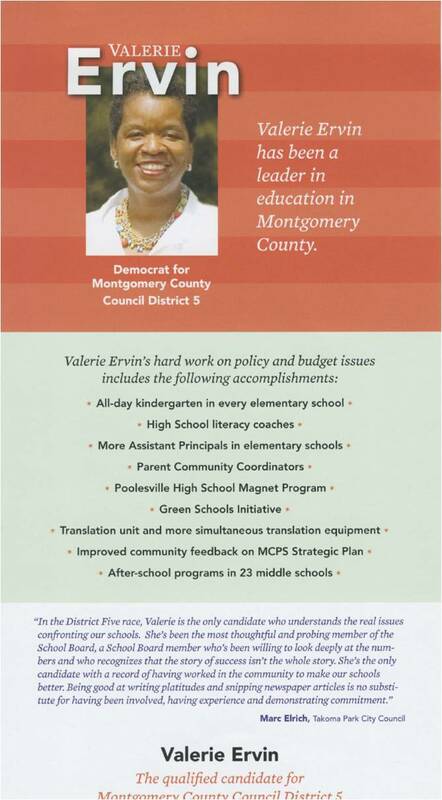 In 2006, she was elected to the council's District 5 seat. 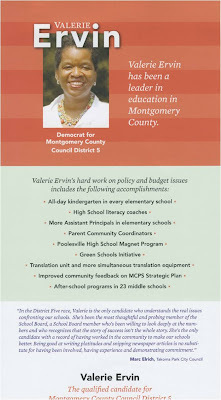 In 2008, she became Chair of the council's Education Committee. 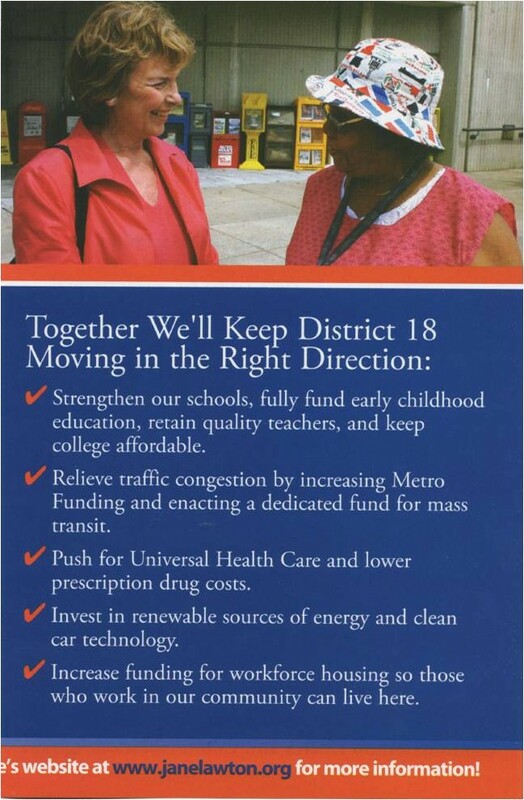 This year, she had no Democratic primary opponent. 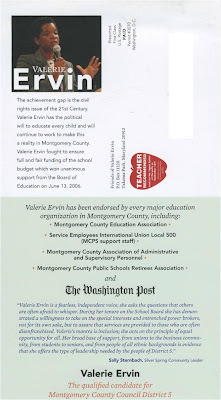 She is now about to be President and many people are predicting greatness for Ervin. We'll see what the future holds! Here is one of her mailers from 2006. 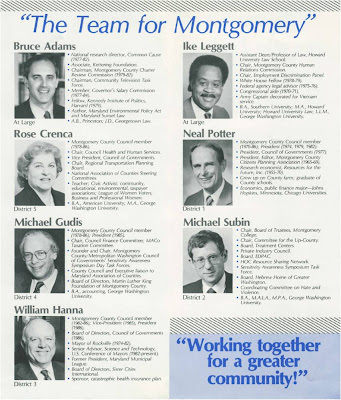 In 1986, seven County Council candidates ran as a slate called Team for Montgomery: incumbents Neal Potter, Rose Crenca, Mike Gudis and Bill Hanna and challengers Bruce Adams, Mike Subin and Ike Leggett. All seven won. 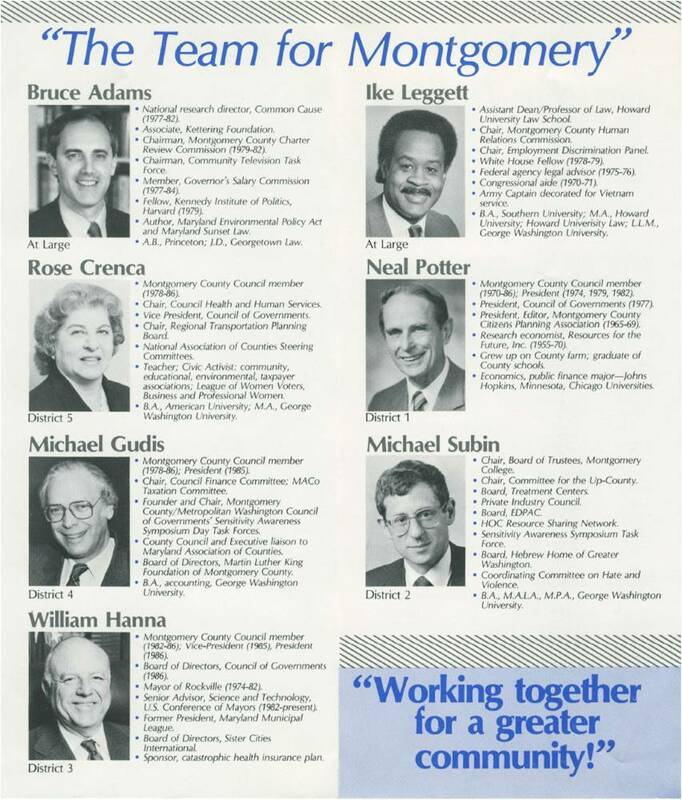 The slate members served a combined 108 years on the council and 8 years (and counting) in the Executive's office, making this perhaps MoCo's most successful political team ever. Here's their joint lit piece. 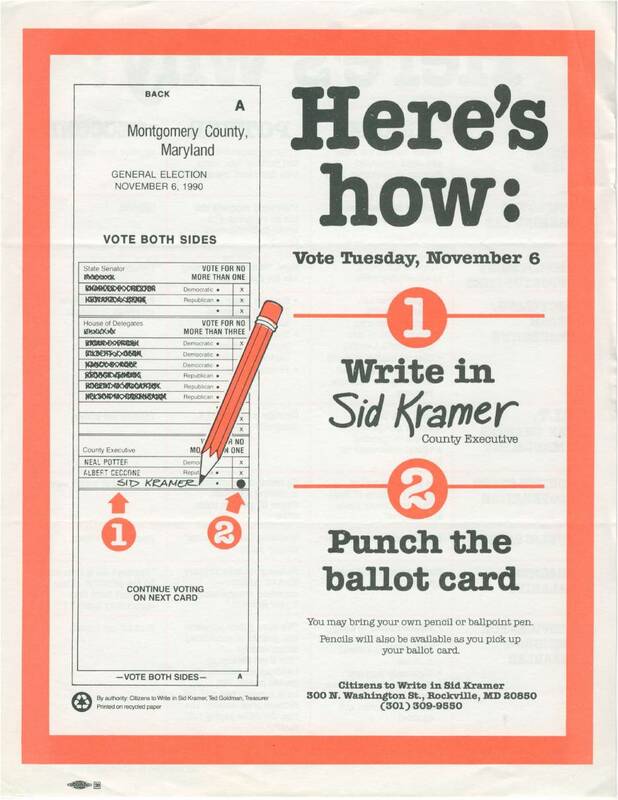 William Donald Schaefer was one of Maryland's great political characters. But this 2001 flyer celebrating his second anniversary as Comptroller leaves even your author speechless! 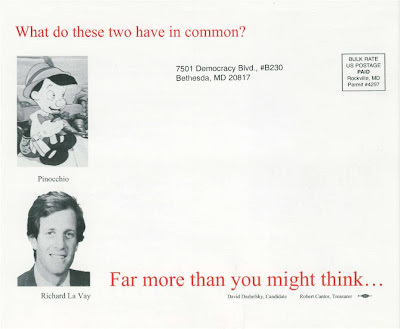 The Seven Dwarfs are not the only Disney characters to appear in MoCo political mail. 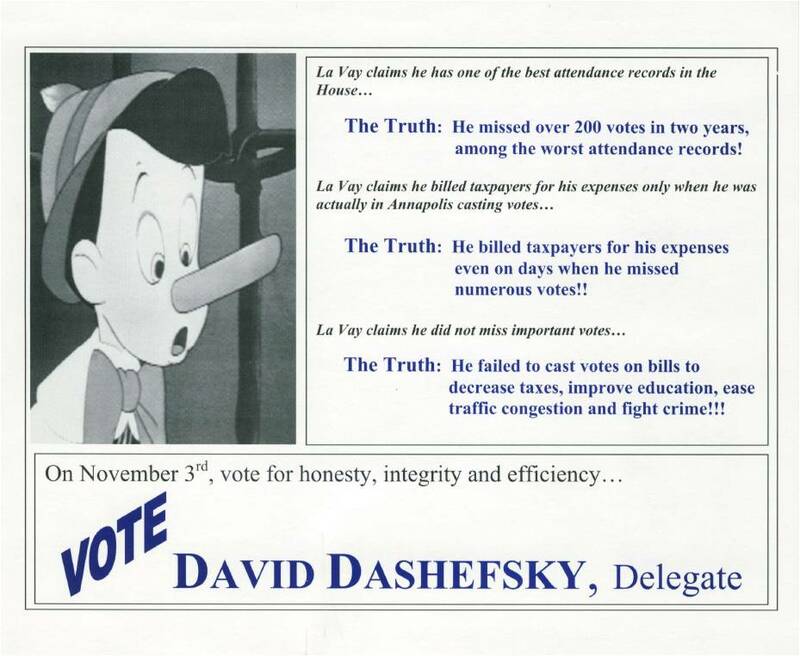 In 1998, Democratic District 15 House challenger David Dashefsky invoked Pinocchio in this mailer attacking GOP incumbent Richard LaVay. Dashefsky lost to LaVay by 577 votes but the mailer lives on. 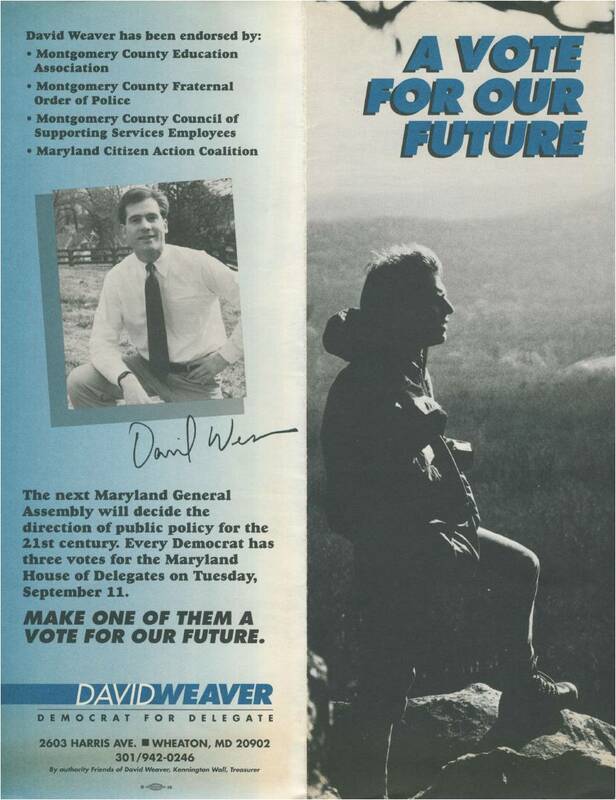 David Weaver is one of MoCo's greatest campaign strategists, spokesmen and staffers. 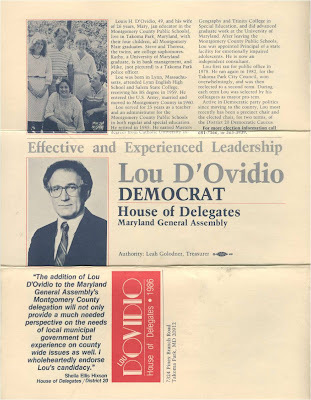 He served as a staffer to Senator Joe Biden, worked on Gus Bauman's campaign for County Executive in 1994, served as Doug Duncan's spokesman for twelve years and was a Chief of Staff for both Comptroller Peter Franchot and Congressman Chris Van Hollen. We suspect there's a lot more ahead for him. 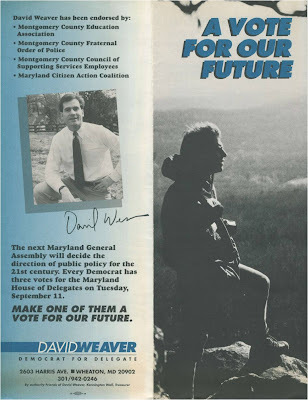 In 1990, Weaver ran for Delegate in District 18. 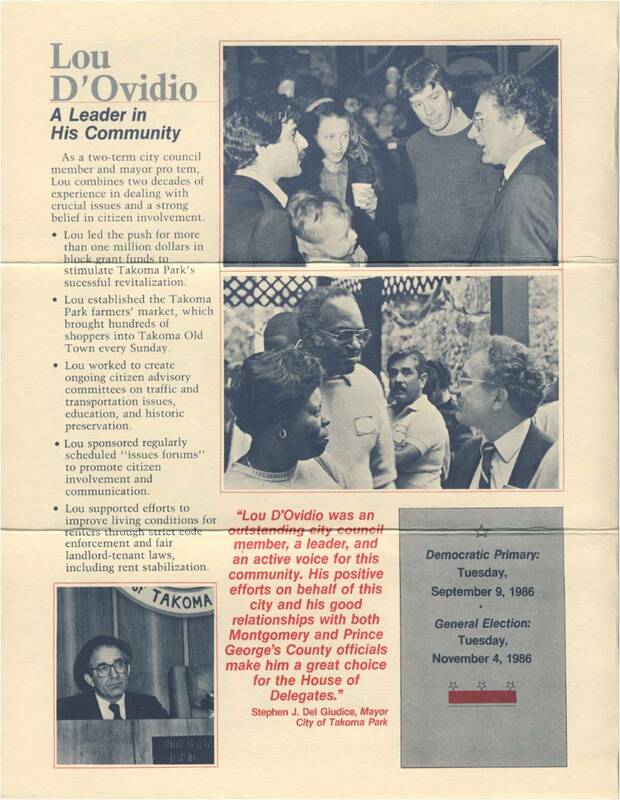 He finished fourth behind Pat Billings, John Hurson and his future boss, Chris Van Hollen. 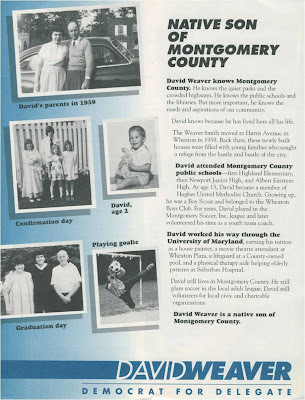 That clearly did not stop him from being one of MoCo's most influential citizens for decades. Here's a lit piece from Weaver's House run. 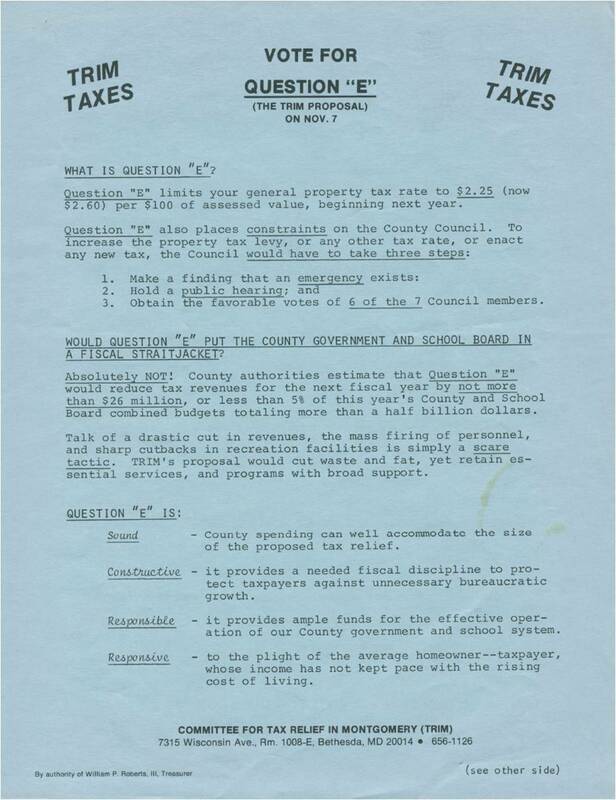 Prince George's County is well-known for its TRIM amendment, a cap on property tax increases passed by referendum in 1978. 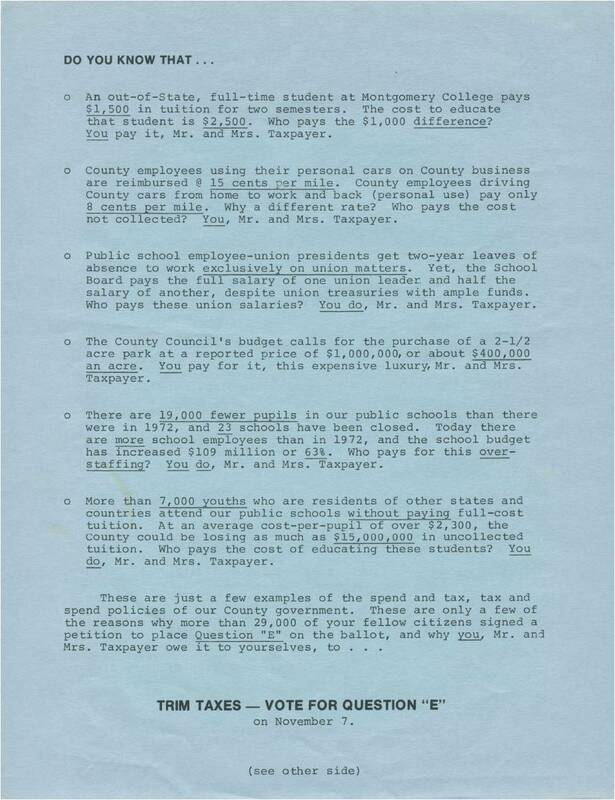 Some blame TRIM for preventing the county from adequately funding schools and other basic services. 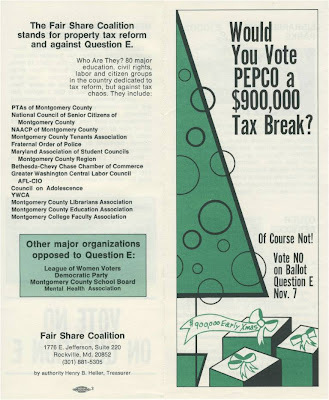 MoCo also had a TRIM amendment on the ballot that same year, known as Question E. A giant coalition of unions, non-profits, civic groups and elected officials gathered to fight it. 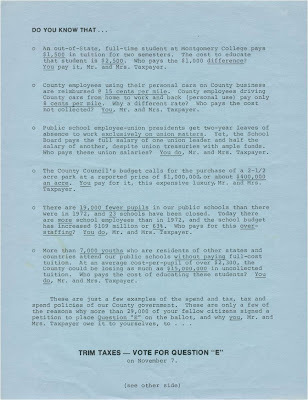 The anti-TRIM leadership included such notables as Council Members Norman Christeller, Neal Potter and Betty Scull; school board members Blair Ewing and Elizabeth Spencer; civic activist (and future Council Member) Don Praisner and MCEA's Hank Heller, who would later become a state Delegate. 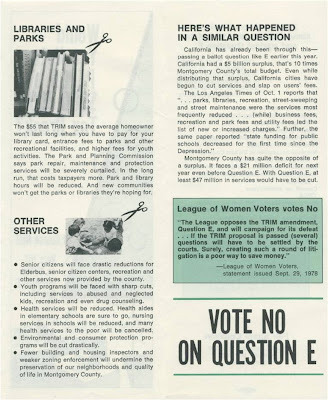 Question E lost on a 71,083-76,731 vote. 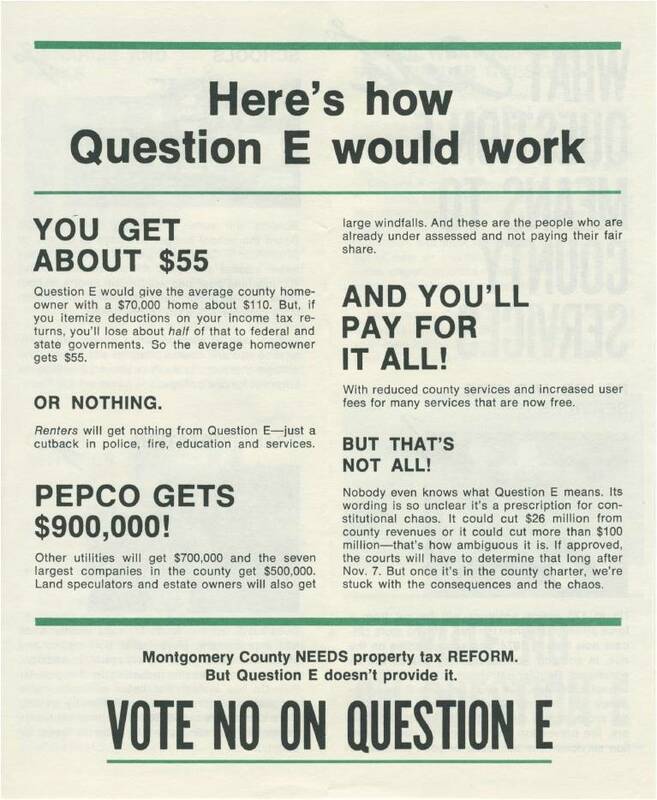 There is no question that it would have changed MoCo history if it had passed. Following are lit pieces from both sides. How Much Web Traffic Do Maryland News Sites Get? 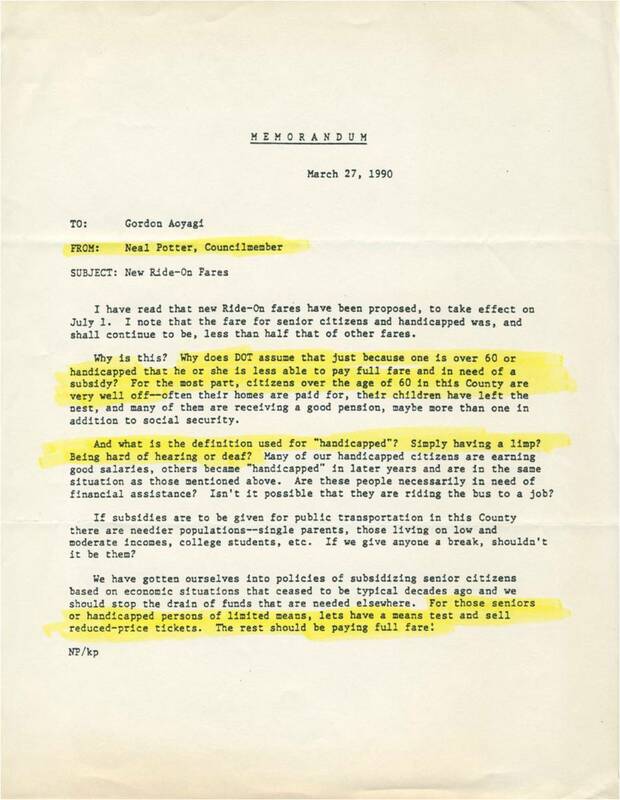 The Craziest Campaign Speech Ever? 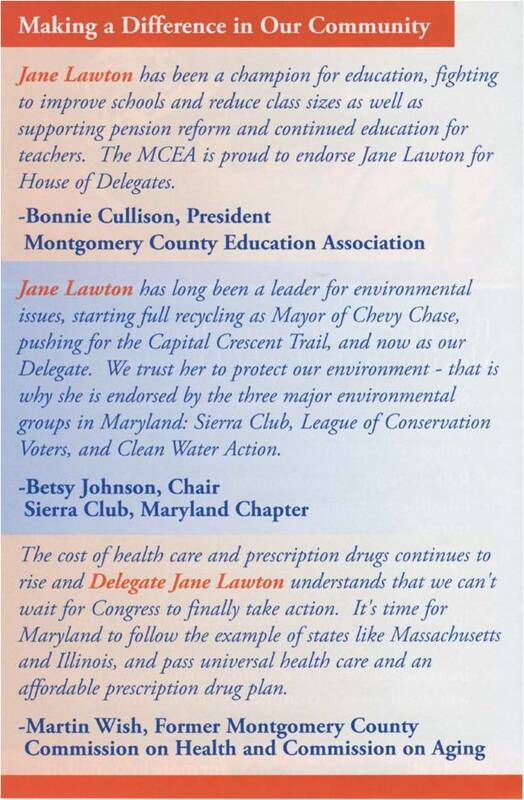 Leggett: Deficit "Close to $200 Million"
Steny Hoyer the New Minority Leader? Possible Dem Senate Gain on the Shore?